Easier to prove things like completeness, decidability, complexity? Makes comparing planning approaches easier because this is the way other planners in the literature are built? Just the default thing AI researchers implement with? Some benefit to the “logic programming” approach that was not immediately obvious? That final reason led me down the rabbit hole. Logic programming was always something I had meant to investigate and maybe this was a perfect use for it. I decided to make my prototype implementation using this approach and see if there was any benefit. I’m going to jump way ahead here and outline the finished product and then we’ll come back and go through each piece in turn to understand them and see how they are built. The AI engine has a bunch of general purpose code that I will be open sourcing eventually to save others the trouble of having to figure it out. It has nothing to do with Exospecies, and for that matter nothing to do with Game AI, it can be used for lots of different applications. It is worth noting that it is all written in C++ so it can be more easily ported to different platforms. While it might sound like a lot of complicated stuff, it turns out the entire engine is not really that much code (1500 lines of C++ for the parser/compiler and 4800 for everything else, excluding blank lines and comments). A huge goal was to keep it simple, debuggable, understandable. The HTN Planner engine does the work that was described in my previous blog entry about Heirarchical Task Networks. It creates a plan given a set of Methods, Operators and Facts. It also allows for “Axioms”, which are simply helper rules. This engine was modelled very closely on the work done by the [SHOP planner team] (http://www.cs.umd.edu/projects/shop/description.html), and is basically a SHOP planner. 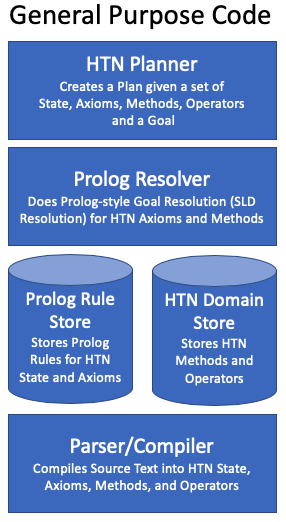 The Prolog Resolver is a simple implementation of the Prolog language that is used for Method resolution, storing facts and for creating Axioms. There are open source Prolog engines out there that I could have used, but they are large code bases and implement all kinds of details required by the full Prolog language. I wanted something that was small, easy to understand, debug and customize. 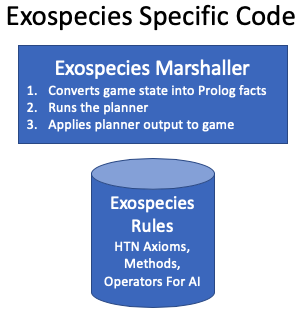 It doesn’t implement all of Prolog (a notable exclusion is functionality for lists), but it has everything I’ve needed for the Exospecies AI and is easy to extend. I found The Art of Prolog to be invaluable when implementing this. This writeup on Unification from the University of Iowa was also key. There is tons of information on the Internet about Prolog, the language, etc. including online Prolog compilers like SWISH that were a huge help. The Prolog Rule Store is a pretty simple name/value pair store that stores Prolog rules and allows for making changes to them while tracking the differences to keep memory usage down. Because the HTN algorithm (and Prolog) backtracks when it fails, there can be a ton of copies of the Rule Store around with small changes. The HTN Domain Store really is just a very simple name/value pair store, and it is just there for completeness. It is a tiny amount of code. All of this code forms the actual Exospecies AI. The next many blog entries will walk through how these different pieces work and interrelate and how they are implemented. I’ll be sharing the code for the engine when I get a chance to clean it up. I got all wrapped up in trying to write the blog post for my survey of AI algorithms, how I classified them, etc. and even I got bored. So, I’m switching to the topic I actually wanted to write about: Hierarchical Task Networks (HTNs, sometimes called HTN Planners). I used them in the first Exospecies AI prototype. I started there for a few reasons: It is a proven algorithm that had already been used in published games, it builds an AI that behaves like a human, and it appeared to be one of the fastest algorithms due to its hierarchical, depth-first, human-scripted approach. Turns out there’s lots of information out there on HTNs but I couldn’t find enough to understand them to the level where I could build one from scratch. I also didn’t find any good examples of using one for strategy game AI. The next few posts will try to correct that. I may come back to writing up the survey once I get some distance from it. In broad strokes, an HTN solves a problem using a very human planning approach that centers on abstraction and alternatives. Alternatives: Let’s use a travel example from the famous SHOP HTN Planner. Imagine you asked me how to get from downtown to the park. I might say, “Well, it is 2Km away but, if it is nice out, I would just walk it. However, if it is raining and you’ve got taxi fare, I’d take the taxi. Otherwise, if you have bus fare, just take a bus.” A abstract thing you accomplish like “travelling from one place to another” is known in HTNs as a “Task”. The 3 alternatives I gave for accomplishing it are known as “Methods” in HTNs. Note that each Method had a “Condition” that went with it: walk if it is nice out, take a taxi if you have the fare, etc. Abstraction: Note that these 3 Methods are at a pretty high level of abstraction. You might further ask me how to accomplish the “TakeABus” Method. I’d say something like, “Well, wait for the #1 bus at the ‘Downtown’ bus stop, pay the driver $1, and ride it to the ‘Park’ stop.”. These three tasks are known in HTNs as “Subtasks” of the “TakeABus” Method. In HTNs, Methods do what they do by decomposing into Subtasks. Now, this is a pretty complete answer for a human but maybe not if we were talking to a robot. In that case we might need to further decompose the task of “PayTheDriver$1” into something like “Reach into your pocket, grab a $1 bill, hand to driver”. Each of those could further be decomposed until we finally have something a robot could do. The final step of an HTN, the part that actually gets done, is called an “Operator”. How detailed you need to get before you are done (and have an Operator) depends on the kind of system you are building. A big part of designing an HTN model is getting your head around what the right abstractions are. State of the world: You are downtown. Taxi fare is $2. Bus fare is $1. Distance from downtown to park is 2Km. Tasks: What can be done abstractly in the world (there may be several ways to do it! ): Travel from A to B. Walk from A to B. Pay a Driver X$. Wait for bus A at stop B. There are no “Abstract Tasks” listed anywhere. This might be confusing since they are supposedly part of the HTN model. Task names are just the union of all the Operator and Method names: Walk, Ride, HailTaxi, SetCash, TravelTo, PayDriver, etc. There are two Methods (i.e. ways) to travel to a place, but they have different times (i.e. Conditions) when they are appropriate. This is a key feature of an HTN model. Even though it seems like a “toy example”, HTN models tend to be very concise. The entire AI for my strategy game is almost finished at 350 lines and over half of those are comments. You may think it is totally bogus to make “Walk from A to B” as simple as changing some string called “Location” in the state. Think about it like this: HTNs allow you to build a simplified model of what you are working on and operate on it in an abstract way. The State is there to make sure your Tasks are doing things that are legal in your “real world”. You will probably ignore the State when it is done and only pay attention to the Operators, which you will map to functions in your “real” code, which have real effects on your real game. No more goals: We are done. You can see how the HTN algorithm starts with a high-level goal and breaks it down into more detailed plans until you have a set of Operators that your system can “just do”, ordered in the proper order. This all works because a human has carefully crafted the Methods and Operators to make sense for your problem. In practice, you don’t end up “thinking about the algorithm” so much. Really, you just end up thinking about the base operations your system can do and about how you’d teach someone to do the things you need done. They won’t produce surprising behavior, which can be good or bad. The system isn’t going to do something it wasn’t told to do. In the future posts I’ll talk about how I actually implemented an HTN and different approaches you could take, as well as how I actually implemented the Exospecies AI as an HTN. Like any design problem, the “best” approach for an AI algorithm depends on what you’re trying to optimize for and the constraints of the problem. So, let’s get some guardrails up by defining the game more formally and listing goals and natural computer advantages. We are going to need all the advantages we can get. This is meant to be a boring distillation of the game mechanics, not a “pitch” for the game! Implementation of algorithms will be very dependent on the rules of the game, so this is here as a reference you can come back to. The goal of Exospecies is to find and destroy all of your opponent’s supply units. How is described below. Exospecies is a two-player, turn-based (meaning not real-time) game. Players can take as long as they want to take their turn and both players take their turns at the same time. It takes place on a map of square “tiles” like chess. Unlike chess, the tiles do not have to be arranged in a square and some tiles can’t be moved over. What is on a tile may change over the course of the game. For example, poison or other items can be placed on tiles by units. The only objects to manipulate in the game are “units” (i.e. aliens), each of which resides on exactly one tile. To manipulate units, players choose from a list of actions such as: move, attack, go underground, etc. Different unit types can perform different sets of actions. The actions can get very advanced (e.g. lay down poison, power up other units). Each action has an energy cost to activate. There is a total energy budget each turn. The energy budget is set by special units called “Supply Units”. Each supply unit on the map adds more energy to a player’s budget. A player can only see enemy units when they are “within range”. This is called the “fog of war”. Each player chooses the set of units that will be available in the course of the battle (called a “formation”). Each map has a limit for the number of supply units that can be chosen in the formation. The game starts with 3 randomly chosen units from each player’s formation placed on the map, far away from each other. Their supply units will always be in this starting set. A turn consists of the user choosing what actions they want to perform on the units they currently have, limited by their energy budget. When both players have chosen, the game calculates the results of the turn, shows it, and then players take the next turn. A player can get additional units on the map by using the “Transport” action on their supply units. This will bring in a randomly selected unit from their formation. When a player finds and destroys their opponent’s supply units, they win! Exospecies turns are complicated because each represents a period of time that actions occur in. Lots can change in this period of time: units can move into or out of range, go underground, explode and splatter poison, etc. Thinking about how things may play out over the time represented by a turn is key to winning. Here’s how it works: Once the players have chosen their actions, the Exospecies engine calculates what happened. It does this by breaking down the turn into twenty points in time (“timeslices”) called “ticks”. It then plays out actions over this time period: units move, run into each other, attack, etc. What team gets to go first in any given timeslice alternates for fairness. This matters, for example, when two units are trying to move to the same square in one timeslice. Some types of games have been extensively studied and formalized in the field of Game Theory. Classifying Exospecies using formal terms, when I could find one, will make it easier to evaluate algorithm applicability. The number of actions available in a turn is limited by energy, so that prunes off large chunks of the tree. However, considering that you can still do about 4 different actions, selected from a number of alternatives, to chess’ 1 piece/1 action means the potential tree is still substantially larger. In chess, a single turn consists of one move and results in a new position for that piece and potentially removing an opponent’s piece. In Exospecies, the turn can involve many units moving for a period of time, interacting during that time, tiles on the map changing, units getting poisoned, etc. The cost of calculating the next state of the game is expensive and often noticeable by humans in the game (you’ve seen the roiling fireball when you end a turn, right?). In chess, a unit move is only constrained by whether tiles are open. In Exospecies, this is also true, but it is also constrained by amount of global energy, which is constrained by what supply units you have and what other units are doing. Actions besides Move can have other dependency chains as well. This makes reasoning about the game more difficult, sometimes a player has to follow dependencies backward to set themselves up to do something in a few turns. In chess, players take turns moving their pieces. In Exospecies, both players take a turn and the result of the turn is then calculated. Unlimited turn time: Unlike real-time strategy games, players can take as long as they want to take their turn. This makes part of our AI challenge easier since we have theoretically unlimited time. Not surprisingly, many of the properties of Exospecies make it very hard for building an AI that plays well. I designed the game to be a rich and deep strategy game for humans, which unfortunately means it will be hard for computers to reason about. The last point needs some explanation: many (most?) strategy games end up cheating in their AI algorithm because building a winning AI is so hard. It could be anything from knowing things that are supposed to be secret (e.g. the opponent’s base) or getting an advantage in odds (e.g. random damage is always high). Players naturally don’t like AIs that cheat because it feels like, well, cheating. Math: Precisely calculating odds, etc. Leveraging combinations: Lots of Exospecies strategy is lighting up combination moves (e.g. when X is Y tiles from a Z it is 2x as powerful). In theory, a computer should be better at finding paths through the game that light these up systematically. OK, I keep talking about cheating, but I really do want to avoid it. However, given how often it is employed by necessity, I feel compelled to think a bit about where the computer could cheat if I absolutely had to? OK, now that I’ve got the problem framed up a bit, my next post will be starting a shallow survey of different approaches. I’ll map them to the points above and filter out a couple of experiments to try. This is a post in a series on building a computer player for Exospecies. Next Post. Exospecies was always meant to have a computer player (aspirationally called A.I.s in the game business)…eventually. I figured I’d launch with only multiplayer (i.e. human vs. human play) since writing a good computer player for a strategy game is notoriously hard. Really, beyond notoriously hard (witness Google’s Go AI). I don’t have PhD’s on my team and I don’t have one. I was going to need time to write a decent A.I. Plus: people are more interesting to play against, right? So my plan was, launch multiplayer, then build an A.I., then launch that. It gets the game in the market quicker, I get feedback from real humans playing (which will surely be more challenging than people playing computers), and then do the A.I. player when it is clear what strategies are being developed by humans. This plan also gave me the runway I’d need. Having a computer player gets rid of a bunch of roadblocks and fills lots of gaps. What finally pushed me over the edge to slip Exospecies until it had an A.I. was my beta feedback coupled with early reviews. The feedback was essentially: “I want to play the computer to learn, and I want to play the computer when nobody else is around, and you really need a computer player. Really.” It was loud and clear, and it only took me running up to the final launch week and getting some blistering reviews to get it through my skull (more on that later in a postmortem). While there is an enormous amount of information on the Internet and in books about A.I. techniques across the spectrum from pure research to practical use in games, there were plenty of places where I’ve been going down dark holes and having a real challenge figuring out either how algorithms work, how to implement them practically, or even how to understand the academic literature. I thought that writing up a blog might save someone else the anguish later and help me collect my thoughts. I thought it might also be entertaining to see how a naive developer gets slapped around by a really hard problem and then rises above it all in glory! (that’s how I’m hoping this ends). Follow along as I learn and attempt to explain the amazing world of A.I. as applied to game development! Eric Zinda is the founder and sole engineer at Inductor software which is developing Exospecies, a turn-based strategy game.